Grand Central Publishing, 9781455599899, 336pp. Meet Mazie Phillips: big-hearted and bawdy, she's the truth-telling proprietress of The Venice, the famed New York City movie theater. It's the Jazz Age, with romance and booze aplenty--even when Prohibition kicks in--and Mazie never turns down a night on the town. But her high spirits mask a childhood rooted in poverty, and her diary, always close at hand, holds her dearest secrets. When the Great Depression hits, Mazie's life is on the brink of transformation. Addicts and bums roam the Bowery; homelessness is rampant. If Mazie won't help them, then who? When she opens the doors of The Venice to those in need, this ticket taking, fun-time girl becomes the beating heart of the Lower East Side, and in defining one neighborhood helps define the city. Then, more than ninety years after Mazie began her diary, it's discovered by a documentarian in search of a good story. Who was Mazie Phillips, really? A chorus of voices from the past and present fill in some of the mysterious blanks of her adventurous life. Inspired by the life of a woman who was profiled in Joseph Mitchell's classic Up in the Old Hotel, SAINT MAZIE is infused with Jami Attenberg's signature wit, bravery, and heart. Mazie's rise to "sainthood"--and her irrepressible spirit--is unforgettable. Jami Attenberg is the author of a story collection, Instant Love, and three novels, The Kept Man, The Melting Season, and The Middlesteins, which was a finalist for the Los Angeles Times Book Prize for Fiction. It will be published in nine countries. She has contributed essays and criticism to The New York Times, Real Simple, Elle, The Washington Post, and many other publications. She lives in Brooklyn, New York. "An exuberant portrait of an unforgettable woman and the city she loves." "The real-life Mazie first appeared in a 1940 New Yorker profile by Joseph Mitchell and later again in his seminal collection, "Up in the Old Hotel." 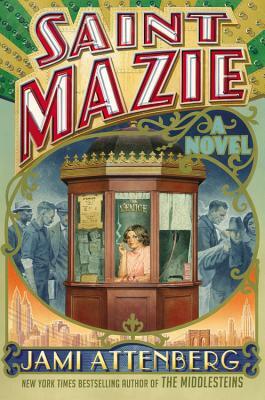 Now Mazie's latest, and perhaps more powerful incarnation, is in the novel "Saint Mazie" by Jami Attenberg. Here Mazie continues to grab the lapels and hearts of readers - and we are all the more glad for the shake-up she gives us . . . Achieves immortality in the minds and hearts of readers." "The Middlesteins author Jami Attenberg has traded writing about the Midwest for Jazz Age New York-and, oh, what a glorious swap it is. If you love historical stories with bold language that vividly paint a picture of another era, you'll be so happy to spend your summer days alongside Mazie Phillips, the real-life proprietress of a downtown NYC movie theater called The Venice. Take a peek inside Mazie's diary, and get swept away. "—Bustle, "The 17 Best Books of Summer"
"This follow-up to Attenberg's beloved novel The Middlesteins shares many of that book's hallmarks: unflinching examinations of some of people's more unflattering qualities, compassion for the same, and a clear love and respect for the journeys we all must go on . . . her work has the same sense of bonhomie and joy as did the original 'Saint' Mazie." "I loved it to pieces . . . Through an incredible cast of voices, Attenberg gives us the story of Mazie Phillips, the bawdy, brassy broad who runs a New York theater from the Jazz Age through Prohibition and into the Great Depression. Mazie never marries but has admirers aplenty, and she grows from party girl into community fixture as she devotes her time to caring for the homeless and hungry. The frame and structure Attenberg gives her story are as interesting as the story itself, and the whole experience is a delight. Highly recommended!" "A terrific novel--touching, funny, big-hearted, just like Mazie herself. It's written with great verve and brio, and I loved the way we circle around and then dig deeper into Mazie's life through the multiple voices and sources. It's Mazie herself, though, who shines the brightest, and who lingers on in the mind and heart, a real diamond in the rough."